Lombardy is a region in the northern part of Italy. It is the most populated region of the country, and has almost 9.4 million people. The capital is Milan. Lombardy has provinces within it. 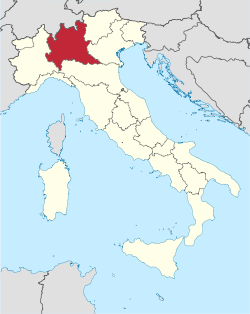 To the north of Lombardy is the country of Switzerland (Canton Ticino e Grigioni). To the west is the region of Piedmont. To the east are the regions of Veneto and Trentino - Alto Adige. To the south is the region of Emilia-Romagna. In the Italian language, Lombardy is called Lombardia. This name comes from an old German word: Langbardland and means "country of the Lombards". In the north of Lombardy there are very high mountains, (40% of the territory is mountains) the highest mountains are almost 4.000 meters in the Bernina Range. In the south of the region flows the Po river, which is the longest river in Italy. The most important rivers are the Adda river, the Mincio and the Ticino river, all of them end in the Po river. There are also a lot of lakes, the largest are the lake Maggiore, the Lake of Varese, the lake Como, and the lake Garda. ↑ "Lombardia, Lombardia, presentato l'inno della Regione". Milano.corriere.it (in Italian). 22 December 2014. ↑ "Monthly demographic balance, January-June 2013". Demo.istat.it. Retrieved 30 November 2013. This page was last changed on 12 April 2019, at 11:38.